Wayyyy back in December, I named Clinique Pretty Easy Brow Palette as one of my favourite beauty discoveries of 2015. I finally got around to editing the photos and sitting down to write this post to show what a difference a good brow powder can do! Clinique Pretty Easy Brow Palette made its debut last year as the all-in-one product to get your brow game on. The sleek, mirrored compact holds a brow powder, highlighter, and wax (fixative), as well as the tools needed to apply each product. 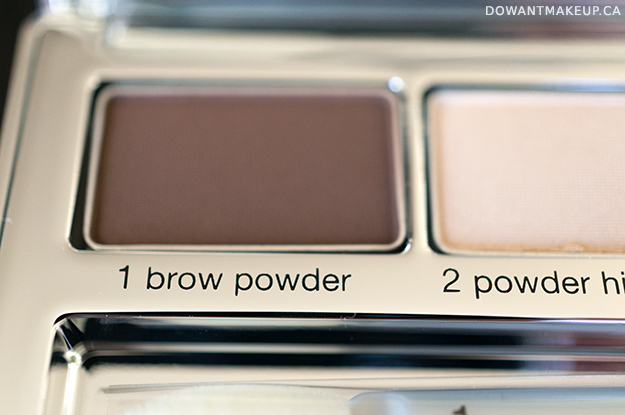 The brow powder is a matte, cool-toned brown. It's not as buttery or pigmented upon first swatch as an eyeshadow, which is kind of a good thing: it's much easier to build up your brows than to apply too much and try to tone it down. And by the way, the colour is such a good match for typical Asian hair and skin tones. It took me a long time to start using brow product because a lot of my early drugstore picks for dark brown brows had a warm or reddish tint, which is not quite right for most Asians--you want something a little cooler or greyish. The powder highlighter is a satiny, slightly warm vanilla shade. In comparison to the brow powder, the highlighter is closer to the texture of an eyeshadow. On my skin, it almost disappears (in a good way), leaving a subtle sheen that lifts the brows and anywhere else that you want a little pick-me-up. Despite how it looks, the fixative has hardly any colour to it once applied, and further defines brows while still keeping the overall look natural. If you have very unruly brows, it may not help much to tame them, though. Seriously, filling in your brows makes such a difference! The only thing that changes between the before and after is my eyebrows (and lips, but that's because I forgot, whoops.) The brow powder both builds up well and blends easily, allowing you to define the tails of your brows and also softly fill/extend the inner brow without that "blocked-in brows" look. Wear time is good and I didn't notice any significant fading over the course of the day. 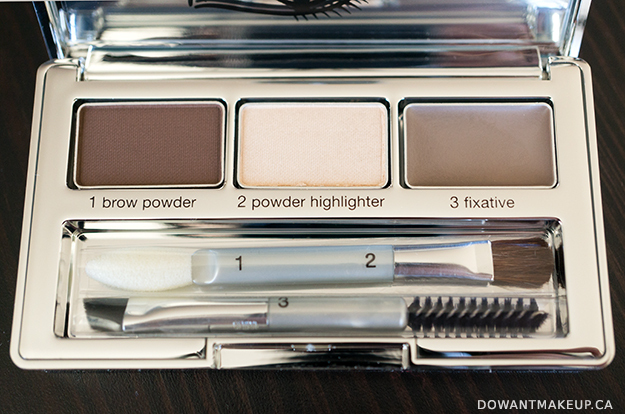 As for the tools included in the palette, they're okay for on-the-go use. I know the numbering suggests using that pointed sponge (1) to apply the brow powder, but I much prefer using the angled flat brush (3) because it's much more precise and results in a more natural look. That being said, I do wish that the angled flat brush was firmer and denser for more control. Lastly, I would prefer using my little finger to apply the highlighter than the fluffy flat brush (2). Again, they're okay considering they're just mini-applicators thrown in with the product, and work in a pinch. Clinique did a great job with this product! The brow shade is spot-on and the soft texture makes it hard to overapply, and thus very beginner-friendly. (I suspect it would also make a very good option as a subtle contour...) At $43, it's not the most budget-conscious option out there, but it would be so good for someone loves having three brow products in one convenient and portable package. If you can do without the highlighter and fixative, Clinique's Brow Shaper contains the brow powder only, and for less than half the price ($21). Hi there! Thanks for taking the time to read and comment! I do my best to reply to all of them within 1-2 days, especially if there is a question. Please be aware that comments containing links may be edited to remove the links or not approved at all. Makeup, nail polish, and other shiny pretty things from a girl in Vancouver. Please respect that I have put a lot of time and effort into this blog and do not repost my images or text, whether it is in part or in full, or as originally posted or edited, without contacting me. Pinning to Pinterest with a link back is a-okay.